Yote: Yes, sir. Mr. Imperial Leader, SIR! Rob: What are you doing, Yote? Yote: Munzeeing, of course, Imperial Leader! Rob: Good to hear, Yote! We have a surprise for you. Yote: A surprise?! Am I finally getting the Yote Munzee?!?!?! Rob: Not quite, but close. 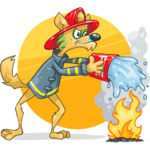 We’re putting The Yote on some badges for a new Munzee type. Yote: Badges?? A new Munzee?? Tell me more SIR! Rob: It’s all below in the blog post, Yote. Thank you for all that you do. Ah, Yote and The Imperial Leader… Well, Rob is correct. We have a new Munzee type coming out. This Munzee is a Reseller Exclusive so you will only be able to purchase them from our Authorized Resellers. They will be released for sale on June 1 at 00:01 MHQ (CST). 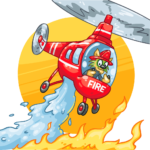 Matt and Rob alluded to it on this past Friday’s videocast, so without any further ado, we’re proud to introduce the Fire Mystery Munzee! Capture/CapOn: Split of 60 by multiples of 5 with a minimum of 10 (eg, 10, 15, 35, 40, etc) — Example: capture = 25, cap on = 35. When captured, the Fire Mystery lights three (3) fires within 1 mile on greenies. These will burn for two hours or until capped. There is an 80% chance that the fire will extinguish. 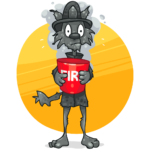 For putting out the fire, you will receive 50 points for capture, and the owner of the host greenie will earn 10 points. The other 20% is a little more dangerous. 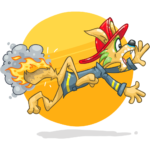 These fires can also burn you. If you get burned, you will LOSE 5 (-5) points. (The owner of the host greenie will still earn 10 points). It’s a choice of risk versus reward. As the saying goes, if you play with fire you might get burned. 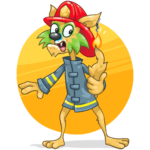 Upon release of the Fire Mystery, we will also have three badge lines: Capping the Fire Mystery Munzees, Deploying Fire Mystery Munzees, and “Getting Burned”. This is where Yote comes in. While we don’t want to go into too much detail of his personal life, he is a frontline firefighter in California who specializes in wildfires. He has very graciously allowed us to use his Yote likeness in the badges. We would like to thank him for that, and even more importantly, everything he does. We also want to take this opportunity to provide help to our friends to the north. If you haven’t heard, Canada is experiencing terrible wildfires right now. Team Munzee is making a donation to the Canadian Red Cross on behalf of the Munzee Resellers to help those affected by these fires. If you would like to donate as well, please visit www.redcross.ca. The Government of Canada is matching all individual donations, and they could use all the help they can get. 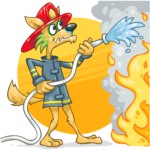 The Munzee app and website will be updated over the next day to reflect the introduction of the Fire Mystery. At the end of 2016, we asked for submissions for the “Make Us A Munzee” competition and then held a final round of voting to choose a winner. In the end, 2dld26 (Deidre Dunhom) came out on top with the Rock-Paper-Scissors Munzee! Since then, we’ve been working with her on everything from points and description, to design, and even to testing. Now, we’re ready to release the RPS Munzee to the public! The RPS Munzee is a credit item for greenies. When it is captured, the player is given the choice between Rock, Paper, Scissors, or Random and plays against the computer. Capture points are determined by the outcome of the game. The RPS is deployed in-app like other credit items. It has the same proximity rules as greenies. The RPS Munzee will be a MunzPak exclusive for the month of June. Each subscriber will receive six (6) in the June MunzPak. Remember your MunzPak subscription renews monthly on your charging date until you cancel. If you would like to start on June 1st also keep in mind the system runs on Central Standard Time (MHQ). Starting July 1st, they will be available in the Munzee Store. More information on that, and a reminder, will come towards the end of June. The app and website will be updated over the next days to reflect the introduction of the RPS Munzee. Once again, thank you everyone who participated in the “Make Us a Munzee” competition, and congratulations to 2dld26 for being chosen as the winner! We hope everyone enjoys the RPS Munzee. Ready to play? Rock… Paper… Scissors… GO! Munzee on! 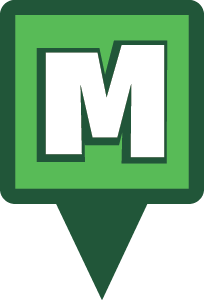 We will be upgrading the Munzee database on Thursday, June 2nd at 10:00 MHQ time. This upgrade will affect all Munzee services including the Munzee game, WallaBee, Eventzee, Runzee, and Zee. While it should last less than an hour, we cannot guarantee a specific duration. This upgrade is meant to improve Munzee service and further our commitment to you, the players. We will keep you updated on the progress during the upgrade. You will also be able to see the status of Munzee services at status.munzee.com. Thank you for your understanding, and Munzee on! As Munzee has grown over the years, the game has evolved in so many more ways than any of the co-founders could have imagined. We’ve certainly had our fair share of growing pains, but in its essence Munzee has tried to stick to its core goal of getting people out into the world. No one knows this better than those players who have been with us since the beginning. 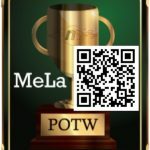 This week’s Player of the Week is Mette and Lars Kristensen (MeLa). Mette and Lars Kristensen, aka MeLa. In the village Harlev, just outside of Aarhus, the second largest city in Denmark. Since May 2013. We started up slowly with a few captures and deploys, but we got addicted after joining our first Clan battle in June 2014. We had been caching for several years but had almost stopped completely after adding two little girls to the family. Munzee was mentioned in a caching forum, and it had to be tried out. It quickly proved much easier to grab some Munzees without doing a lot of planning up front. We both really like the social aspects of the game. After joining a clan of local players (Jutlandia), we have met a lot of great people. We enjoy going to events and more informal meetings, too. It’s also great interacting with players all around the world. 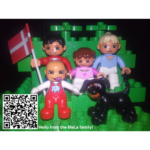 Mette does a lot of social trading, and we are both in several Munzee-related groups on Facebook. We also really enjoy chasing down the bouncing specials, Mythological as well as seasonal. It’s a great addition to the game. Finally, the fundraisers! We think it’s great when Munzee does charity fundraisers. Do a bit of good AND make points – what’s not to like? Some day we would love to be able to travel abroad to a big event like MHQ Bash or Munzee Madness. And to a lot of a clusters around the world. It would be great if the deploy process for physical munzees could be changed a bit such that the munzee wouldn’t actually be deployed until after naming it, adjusting for position, and optionally converting it. Among other reasons, it would make it possible to back out of a deploy if it turns out you can’t convert it to what you wanted. Oh, and more badges! There can never be too many badges. Finally, we wish that we hadn’t forgotten to capture a munzee on day 300 in our capture streak. We have a combined age of 78 years and originate from different parts of Denmark. We met 11 years ago while working as volunteers, raising funds for the Danish Muscular Dystrophy Association. Together, we have two girls, Maja (5) and Ida (3), and a dog. Lars says: You can call me a geek, and I won’t be offended. I work as a software developer, currently within the health IT industry, building software for hospitals. 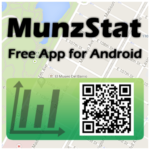 Some of my spare time is spent developing and maintaining the MunzStat app (Android only, sorry Apple fans). I really enjoy being able to contribute to the Munzee community while having fun and learning a lot in the process. Mette says: I’m a socialholic. There, I said it. Searching for socials I haven’t captured yet is fun and time consuming. But I like collecting stuff. I hope there will be a badge for 10,000 socials when I get there. Just around 3,000 to go. I wish capturing a social awarded you with just one point, then more people would probably get into socials. Lars: I play electric guitar in a local rock music cover band which is great fun! To anyone involved in our nomination, thank you! This wouldn’t have happened had it not been for MunzStat. Thanks for all of the positive feedback. It really means a lot and keeps up the motivation. Also, thank you Scott Foster and Daniel Fischer for your help and support. MeLa also included some socials, so cap away! Since the first MHQ Bash two years ago, the event has continued to grow each year as the biggest Munzee event worldwide. Much like our home state, everything is bigger in Texas so we’re continuing the tradition this year with MHQ Bash 3 dubbed “MHQ Lone Star Bash”! Lone Star Bash Kickoff (6 PM): We’ll be kicking off Lone Star Bash at TUPPs brewery once again with food catered by Green Pin Kitchen. The kickoff will work as a meet and greet with the MHQ staff (the entire global team will be here!) and other players from around the world. Lone Star Bash Games (9 AM): The fun continues on Saturday morning at Gabe Nesbitt Park in McKinney, Texas. There will be plenty of room to cap and deploy while having fun and playing Texas-themed Eventzee games. Lone Star Bash Fair Day (4 PM): What better way to cap (pun intended) off a day of fun than to visit The State Fair of Texas! We’ll be riding the train down to the State Fair and spending the evening exploring what it has to offer. Join the State Fair themed Eventzee hunt to really get a taste of Texas! A list of events with links to the Munzee Calendar can be found here. As with previous MHQ Bash events, there are different packages available for purchase. Pre-sale ends July 8th at 23:59 MHQ Time. Starting at 00:00 MHQ Time on July 9th, the price will raise to $115. Pre-sale ends July 8th at 23:59 MHQ Time. Starting at 00:00 MHQ Time on July 9th, the price will raise to $75. Pre-sale ends July 8th at 23:59 MHQ Time. Starting at 00:00 MHQ Time on July 9th, the price will raise to $50. Pre-sale ends July 8th at 23:59 MHQ Time. Starting at 00:00 MHQ Time on July 9th, the price will raise to $55. The “Tumbleweed” package for Lone Star Bash is the free package that includes only a Lanyard and Nametag. All other events and merchandise must be purchased separately. If you are planning to attend, you MUST register for at least the Tumbleweed Package so we can have an accurate head count. Please DO NOT purchase more than one package per person. If you are purchasing anything above this, you DO NOT also need to purchase the Tumbleweed Package. As stated above, pre-sale ends at July 8th at 23:59 MHQ time. Orders will not be taken online after September 1st at 23:59 MHQ time. After that time, you will only be able to register at the event, and you may not receive all of the contents of the packages. You can also purchase individual events and merchandise. To see all of the packages, events, and merchandise, you can view the Lone Star Bash Collection on the Munzee Store. We want to make this the best MHQ Bash yet, and we can’t wait to see everyone! Munzee on! Is there a lodging discount? Yes! We’ve secured a guaranteed rate from the Holiday Inn & Suites of McKinney. You can follow this link or call (469) 952-2044 and mention “Munzee” to get the block of rooms we have set aside. “Are the events pet friendly? Outside of TUPPs and at the parks, yes. Aside from that, no. Will you ship my items to me? No. We will NOT ship items. You must be present or give permission to someone to pick up your items. Yes! Anyone is welcome at TUPPs. There will be water and soda available for those who don’t or are unable to drink alcohol. You MUST bring your ID is you have one. It’s that time again! Munzee With Team Munzee – May will be happening next Thursday, May 26th. We will be meeting at The Village at Allen in Allen, Texas from 9:30am MHQ time through 11:30am MHQ time. At 11:30, we will be joining the Puli and Squirrel Visit MHQ event at Plucker’s Wing Bar in the same area. It’ll be a great day full of fun, so come out an join us! This post only applies to Android users, not iOS users. 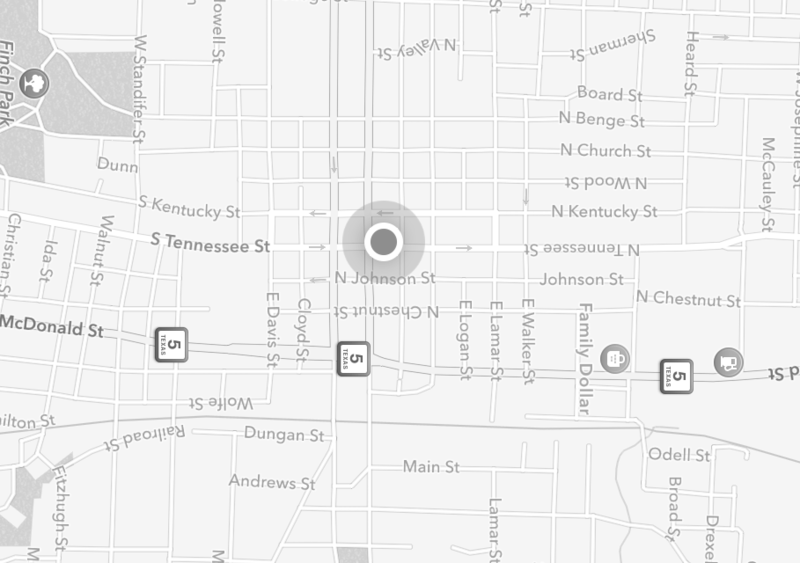 Shifted pins on the map with correct proximity circles. This issue does not affect all users, and pins on the deploy/pin placement map ARE NOT affected. If you notice the white square icon problem, you can try the refresh button or select that munzee to see the correct icon in the munzee details banner. The issues have been reported to Google, and we hope an updated Google Play Services will be pushed out shortly. As Munzee has grown over the years, the game has evolved in so many more ways than any of the co-founders could have imagined. We’ve certainly had our fair share of growing pains, but in its essence Munzee has tried to stick to its core goal of getting people out into the world. No one knows this better than those players who have been with us since the beginning. This week’s Player of the Week is Cheryl Wright-Turner (eggbox27). I discovered it in September 2014 and went on a few hunts thru the Autumn and then really got into it from January 2015 and have been capping and deploying since. I’ve absolutely no idea. I’m sure I saw a link somewhere and followed it and it went from there. At the time, I was on maternity leave with my youngest, and I have since used it as a good excuse to go out for a walk and get some fresh air. I love getting out and going for a walk about and finding munzees, although my pet hate is tree protector hides. I also enjoy seeing new areas and visiting new places. Events are a great way to meet new, like-minded people, and so far, I have been joint host for two with another in the planning stages. I have also managed to travel to a couple of events and hope to travel to some more in the future. I love the fact that I have made some fantastic new friends, both for myself and my family. My youngest now has a girlfriend whom lives at the opposite end of our road whom we we met thru Munzee, and our clan members are all local players, so we help each other to meet our clan goals each month. I met CoachV and PilseyGuy last summer at events and look forward to meeting more people over the coming year. To travel to McKinney, the home of Munzee, failing that Orlando, or anywhere in the states with large clusters of munzees. I have a trip to Cologne planned for later in the year so hopefully I should have fun capping there. I also wish my network provider increased their internet coverage in my local area as once out of the city coverage drops and there are some lovely areas locally I’d love to cap and deploy in which I struggle with using my current provider. I’m married and blessed with 3 wonderful boys aged 9, 8 and 21 months whom often come out capping with me. The older two are great at running ahead and finding them whilst I catch up with the push chair. I’m sure in the future they will want their own accounts in the future. I work part time in retail which I love, and am also a Beaver Scout Leader (the youngest section of Scouting in the UK) and a school governor, which enable me to put something back in the community. I met one of my best friends thru Scouting and she now munzees regularly with me. I have lived in Norwich since I came here to study at university and haven’t left since. It is a beautiful and quiet corner of the country with a growing community of Munzeers and lots of Munzees. It is also close to the coast which I love to visit. Apart from Scouting and Munzeeing, I enjoy spending time with my husband and boys and going for days out.. I feel blessed to have been nominated, and look forward to growing the map, meeting more players and capping more Munzees!!!. eggbox27 also included some socials, so cap away!